If you first discovered the fun of quilting and sewing in your own home, then you know that some of the best quilts and stitched pieces are crafted with the help of some powerful equipment. A lot of us grew up carefully walking around a massive sewing machine that belonged to our mothers, grandmothers, or quilt crazy relatives that rented one from the craft store. If you're anything like me, when inspiration strikes for a crafting idea, you need to be able to dive right in without a second thought. Quilters and designers will flourish if they always have access to their quilting tools. A portable sewing machine is a perfect solution to this, especially if you're looking for a way to spend your downtime on a family vacation. Once you’ve decided whether or not a portable sewing machine might be a good investment, it’s a good idea to make sure that you have all of the information that you’ll need to pick the right one for you. You’ll want to compare portable sewing machines that have all of your must-have features, won’t break your budget, are super easy to use, and will last a long time. We’ve done some of the work for you, take a look below to read our 5 portable sewing machine reviews below. 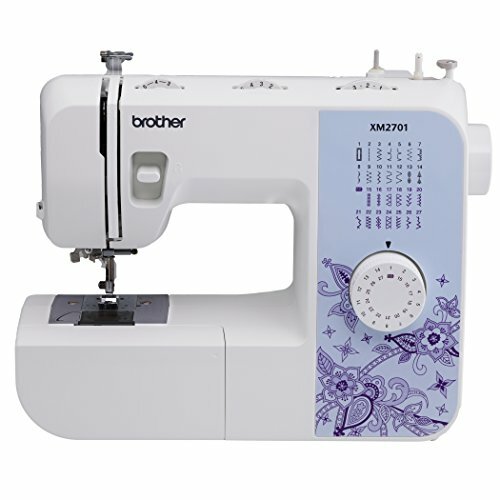 Brother CS6000i 60-Stitch Computerized Sewing Machine: best high quality portable sewing machine. SINGER 7258 Computerized Sewing Machine: lightest, full-size portable sewing machine. Brother HC1850 Computerized Sewing Machine: best for number of stitches available. Haitral Portable Sewing Machine: smallest, lightest model reviewed. Brother XM2701 Lightweight Sewing Machine: full featured, compact model with high customer satisfaction. What Can Portable Sewing Machines Be Used For? How Much Do Portable Machines Cost? If you’re going to be doing endless quilting and scrapbooking with the help of your new sewing machine, you’re going to want to keep your eye out for some must-have features that you’ll need to get the most out of your investment. This feature boils down to preference and how much you can afford to invest in your crafting. If you opt for a lightweight, battery-operated model, that might be the best fit if you're a casual crafter and you don't think you'll be using your sewing machine very often. However, if you're more of a consistent crafter, a battery operated, portable sewing machine can be costly in the long run. You should double check that you'll be able to easily afford the type of battery that your sewing machine uses. If you go with an electrical model, you'll eliminate this problem, but you'll always need to find an outlet for your sewing machine, which may eliminate the perk of having a portable sewing machine. When you start shopping for a portable sewing machine, you’ll see handheld and tabletop sewing machines. While your personal preference plays a small role in this, you should be aware that a handheld sewing machine is usually on the smaller side, and is a good fit for smaller projects. If you’re new to sewing, this might be a good fit since you probably won’t be using it a lot at first. Handheld sewing machines will usually be the less expensive option, and a little easier to learn with. A portable tabletop sewing machine is the perfect fit for the crafter that can't stand to be away from their project for too long. These sewing machines will work similarly to the full-size sewing machine that you might have at home. Additionally, if you're just a beginner that isn't ready to commit to the price of a full sized tabletop sewing machine, this is an excellent choice for you. Your portable sewing machine might come with a few different stitches that vary in width and length. A portable sewing machine could come with straight, buttonhole, zigzag, or chain stitches. There are some portable sewing machines that may only be loaded with one stitch. You'll want to be sure to double check the number of stitches and the number of free sewing accessories that come with a portable sewing machine before you make your final choice. Once you’ve started scouring stores for a sewing machine, you might be tempted to go with a portable sewing machine since they’re usually more affordable. However, if you intend on using a portable sewing machine as your primary tool, you need to know the difference between a portable sewing machine and a regular sewing machine. A portable sewing machine has a few fundamental differences that won't go unnoticed by an experienced crafter. You'll find that a portable sewing machine is slower, which is ideal if you're new to sewing because you're going to need a machine that moves a little slower at first. However, an experienced quilter might not care for the slow speed of a portable sewing machine, or the fact that a portable sewing machine doesn’t come with as many automated features as a full sized sewing machine. You might have to install extras like buttons and zippers separately. Additionally, your portable sewing machine may not come equipped with a built-in light as the full-sized model does. There are plenty of perks to having a portable sewing machine, they're an excellent learning tool for beginners, they're usually much cheaper than a full-sized model, and they're lightweight. If you’re concerned that you might be sacrificing quality by using one of these smaller powered machines, then you might want to stick with a full-sized model, especially since you’re less likely to encounter issues like a slow-moving machine, or a needle that can’t handle thick fabrics. Scrapbooking. If you're not much of a quilter, you can enhance your scrapbook skills by using it to sew stitches onto your pages and add unique and stylish embellishments to your work. Learning. If you’re new to sewing, whether you intend to use a sewing machine to make costume pieces, quilts, or scrapbooking embellishments, it’s a good idea to start on a portable sewing machine. There’s going to be a pretty big learning curve when you first start sewing, and it’s a good idea to start out on a portable sewing machine before you commit to buying an expensive, full-sized sewing machine. Additionally, if you’re trying to teach a child how to sew, these are a great tool because portable sewing machines usually have simple patterns, which will make it easier for your young student to keep up. On-The-Go Stitching. You’ll have the enormous advantage of being able to take your sewing on the go, which is perfect for dedicated designers and crafters that need to be close to a sewing machine to try out new ideas and make last minute changes. When you start shopping for a portable sewing machine, you’ll be happy to see that a portable sewing machine will usually cost less than a full sized sewing machine. A portable sewing machine can cost anywhere from $20 to $130 depending on the size, model, brand, and accessories that come with the machine. If you purchase a portable sewing machine on the lower end, around $20 or $30, you’ll notice that they’re much smaller than average, and some are designed to be purse-sized or handheld. However, if you’re more of a serious crafter, you can invest in a tabletop portable sewing machine, which will usually pack a bit more power, be able to handle thicker fabrics, and come with more stitches. A full sized sewing machine can cost anywhere from $130 to $800 depending on the type of sewing machine it is. If you’re still on the fence about whether or not you should just buy a full sized sewing machine, consider looking into a higher end portable sewing machine so that you won’t have to sacrifice as many features, and so that you’ll still be able to enjoy the advantages of having a sewing machine that doesn’t take up a lot of space, and is easy to learn on. Why You Should Buy It: The Brother CS6009i 60-Stitch Computerized Sewing Machine is a very good buy. It’s great for beginners that would like to dabble with some of its fancier built-in stitches. You won’t have to worry about noise if you’re working late into the night, this machine is very quiet. It comes with a hard carrying case that you can use to transport this sewing machine wherever easily. It's lightweight and comes with a few decorative stitches and an LCD. It might not be compatible with bobbins that you have from previously owned machines. The built-in light on the machine is a bit dim - you may have to purchase an additional light to use with the machine. The Brother CS6009i 60-Stitch Computerized Sewing Machine is a lightweight, portable sewing machine that comes with 60 built-in sewing stitches, an LCD, an integrated free arm for sewing cuffs and sleeves, and a wide table for big projects. It is optimized for convenience, and it's an especially good fit for beginners. When you purchase the Brother CS6009i, you'll also be getting a threading diagram and a quick start guide with instructions on how to use the machine. It weighs 17.4 lbs. and comes with a 1-year warranty. This portable sewing machine is a good start for beginners. Seasoned sewers might prefer a larger and more expensive machine. Some buyers mentioned that it's a little difficult to hem jeans and that the bobbin winder is a bit slow, but this can be amended with a change of bobbins. Brother's CS6009i is our editor's top choice for a portable sewing machine! Why You Should Buy It: This award-winning machine is a great choice for the crafter that's looking for a lightweight but high powered machine that they can take anywhere. It's perfect for long time sewers and beginners that are brand new to sewing. This machine has wowed buyers with how quiet it is. It's a long lasting machine, and can easily sew through thick denim despite its size. It’s equipped with a self-threading needle. The thread cutter isn't always consistent, and it could use a better guard. There are issues with the bobbin winder; it doesn't always work as well as it should. The Singer 7258 Computerized Sewing Machine is an award-winning, light-weight, portable sewing machine. It only weighs about 14 lbs., and you can order a solid white, plastic carrying case for this sewing machine. When you purchase your Singer sewing machine, you can order the 7258 with 70 or 100 stitches. This easy to use, lightweight machine is not battery operated, it comes with a 69 in. long power cord. You'll enjoy some of the Singer's other features like the LED work light, the onboard free arm storage compartment, one-step buttonholes, easy push-button stitch selection and ten presser feet. 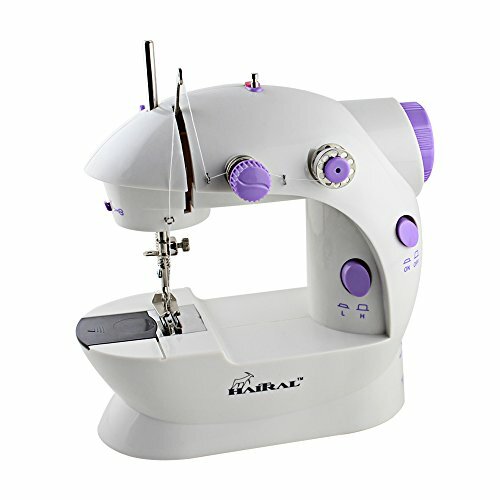 This machine is an excellent choice for beginners and sewing pros, it's easy to use features make it a top-selling item. Why You Should Buy It: The Brother HC1850 Computerized Sewing Machine is the perfect machine for experienced quilters and is a fantastic buy for the price. Can cut through extremely dense fabric and multiple layers of fabric. It's a great starter machine for beginners, and it's a long lasting machine that you can grow with while utilizing a variety different stitches that are included with its built-in 160 stitches. The bobbins are easy to wind, and the sewing machine comes with a DVD that you can reference if you get stuck. The auto-threader isn't consistent, sometimes it works well, and other times it doesn't. There's not a lot of room for accessories; you have to keep all of your accessories together in a vinyl bag as opposed to a flip-up compartment that you might see on other sewing machines. The Brother HC1850 is a portable, computerized sewing machine. Beginners will enjoy being able to use a machine with the qualities of an expensive, full-size model. This sewing machine comes plenty of accessories that make it more than worth the money. Those accessories include a zigzag foot, a monogramming foot, a blind stitch foot, a disc-shaped screwdriver, a seam ripper, a zipper foot, a buttonhole foot, an extra spool pin, an overcasting foot, a button fitting foot, a cleaning brush, an eyelet punch, four bobbins, a spool cap, and a foot controller. Additionally, you'll love the LCD that you can use to help you choose from any of the 160 built-in stitches. Why You Should Buy It: If you've wanted to take up a new hobby, whether it's learning how to sew so that you can mend your old jeans or using a sewing machine to elevate your scrapbooking, the one-pound Haitral Portable Sewing Machine is the best option. Extremely lightweight, you can tuck this sewing machine into your purse or backpack because this little sewing machine only weighs one pound. This sewing machine is super easy to use and is a great learning tool for children and adults. This sewing machine is ideal for both beginners and experts, the beginners will enjoy its ease of use, and the experts will like that they can easily carry around a sewing machine that they can use to make adjustments to old shirts, jeans, and jackets while working on their project. It's also ideal for scrapbooking. Because of the Haitral’s small size, it has a hard time cutting through thick fabrics. It is made of plastic, so you have to be pretty careful with it because it's not very durable. The Haitral Portable Sewing Machine is a lightweight and portable sewing machine, and it’s ideal for learning how to sew or for completing scrapbooking projects. You can add embellishments to your scrapbook with the help of this portable sewing machine, and you can try out new designs. If you're interested in teaching someone how to sew, the Haitral Portable Sewing Machine is a good fit. It's small size make it perfect for a small child to operate with adult supervision. Additionally, if you're worried about a child damaging the machine, it's inexpensive, so you won't have to worry the same way that you would with a more expensive machine. Why You Should Buy It: You can enjoy all of the features that an expensive, full-sized sewing machine offers. It's easy to use and only weighs 15.8 pounds, which makes it an ideal portable sewing machine. It’s a lightweight machine that comes with a lot of easy to use features, for a low price. The machine comes with an easy stitch selector in a dial. The machine allows you to make any size buttonhole in one step easily. The foot pedal isn’t as strong as it should be on some models. The foot pedal is very sensitive, and it can be too much or too little in speed from very little pressure. The Brother XM2701 Lightweight Sewing Machine is perfect for the crafter that wants a high-quality sewing machine for under $200. It is lightweight and equipped with a ton of easy to use features, and the machine is not intimidating for beginner level sewers. Additionally, if you're a beginner, you'll benefit from the DVD that is included with the purchase of this sewing machine. You can relax knowing that the Brother XM2701 comes with a one year warranty, along with 27 unique stitches. A portable sewing machine is ideal for crafters that are hoping to use different tools when they're scrapbooking or crafters that want a portable option so that they can work on their projects wherever they go. You'll want to consider investing in a portable sewing machine if you're hoping to teach a small child how to sew, or if you're a beginner. You can find some affordable portable sewing machines that will give you everything that you need to complete your projects. You don't have to pay the price of a full-sized model, for the quality that a full-sized model can deliver. Sewing is so much fun once you have the right machine. I learned the to sew just with the help of YouTube videos and some ebooks. It’s so easy when you get the hang of it. Thanks for this review; it’s springing up some thoughts in me already to take my skills to the next level. I will get one of these soon. When I was first starting out, I watched a lot of YouTube videos as well…great place to start. Thanks for stopping by Lilian! The singer machine is just the perfect sewing machine for me. The full sized, medium-sized and portable sized are all great products and very easy to learn and work with. I totally recommend. I love the Singer brand as well..
My design project made me go get a small sewing machine that can be carried almost everywhere. I decided on the Brother HC1850 Computerized Sewing Machine. Though it was not the most portable one I found, I just loved the features. It has 160 built in stitches and is perfect for a beginner like me. Yay!!!!!!! My aunt just got me the Brother XM2701 for my birthday!!! I just love the machine, it’s really portable, cute and has these amazing features. Congrats Joyce – best of luck with it! Yay!!!!!!! My aunt just got me this wonderful Brother XM2701 Lightweight Sewing Machine for my birthday!!! First, how did she even remember? I never told her! Best of all, how on earth did she know I’ve dreamt about this machine for long! Well, my mom is the closest suspect. I just love the machine, it’s really portable, fancy and has these amazing features. Wow. So many nice options! I want to join a sewing class. But right now, I’m still not sure which machine to go for. Well, maybe I’ll take this list to my sister (who has been sewing forever) to help me decide. My favorite is the Brother CS6000i. It’s priced well, has a good reputation and is easy to use. I’ve been taking sewing classes for weeks now and even though I’m learning as fast as I can, I haven’t really had much time to make anything for myself yet. Thanks for your blog and the time you’ve spent writing it….it’s been a big help to me. Hmmmm. These looks like very good options. I really want to learn sewing and I don’t even know where to begin. First off, I’ll just pick one of these lovely promising machines and then look for a tutor to guide me through it. Whew! My Brother HC1850 is my pride and joy! Good thing it made the list. Even though it doesn’t have enough room for all my accessories and the auto threader is not consistent, it still delivers great results for me. The Brother CS6000i 60-Stitch has to be one of the best mini sewing machines I’ve actually used. Though I have a full-sized model I can use around work, this one is used at home to help add some little touches to my finished clothes. After taking craft lessons and learning some scrapbooking, I’ve been saving up to get my own sewing machine. After my research, I realized that the Haitral Portable Sewing Machine is the most affordable and awesome product I’ve been looking for. Bit of advice, if you need the best portable sized sewing machine that is cheap, good for scrapbooking and has great features, I would recommend the CS6000i. You’ll love it.